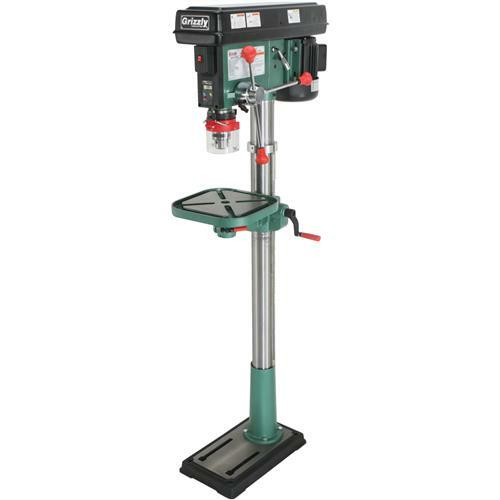 This 14" Heavy-Duty Floor-Model Drill Press features a digital spindle travel readout and laser pin-point accuracy for quickly aligning the workpiece to the drill entry point. Table size: 11-3/8" x 11-3/8"
Approximate shipping weight: 171 lbs. The drill press works great. 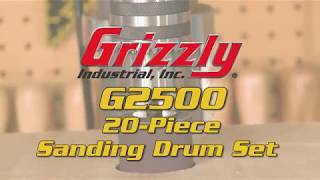 I can see many years of work out of this just like my other Grizzly tools. 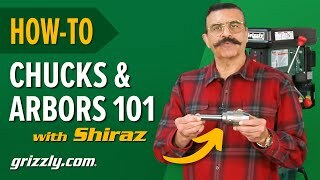 One recommendation for buyers or Grizzly tec. folks. I paid the premium for the upgraded model with laser and electronic read out. Others might just save your money and get the standard model. 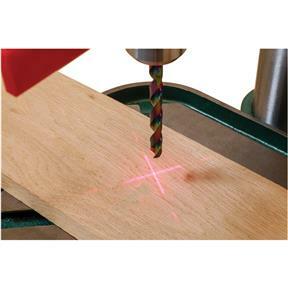 The laser is not strong enough to show up on the work piece with any amount of normal shop light. The electronic depth gauge has the same problem. Not bright enough to see the readout. Just buy the regular model. 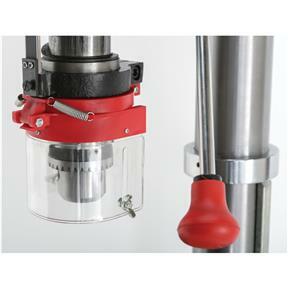 The Drill press has been a great addition to the shop! There were casting flaws in the tabe consisting of slag deposts preventing the T-Slot nuts fro sliding in all slots. Also the deposts were extensive in th outer tray whcih I removed, but it looked terrible, so I painted it. No quality control on it, appearently. The drill press was easy to put together, the laser could be a little stronger, but it is quiet and plenty of power with 12 speeds. great power with smooth operations. 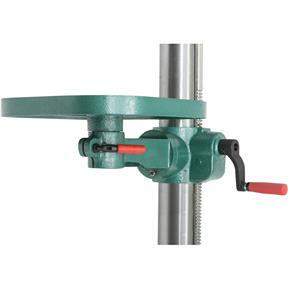 the drill is extremely quiet even with a heavy load. I was using a 3-1/8" forstner bit on pine logs and the drill plowed right through. Excellent tool. Can't believe I've gotten by for years without one and this was "the right one" for the right price. Easy to assemble, easy to use. First time buyer and couldn't believe the quality for the price I paid. Easy to set up and works very well. Instructions were clear I've been very pleased. Works just as advertised, Great value. The only concrete is it lacks a light. This drill is ok. I think the laser on it is worthless and the depth gauge thing is not worth anything either. 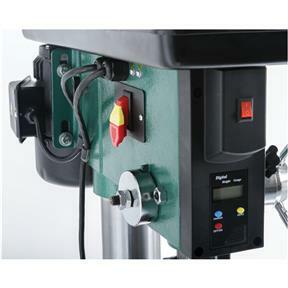 I like the adjustable table but it is not very stable when moving up and down. 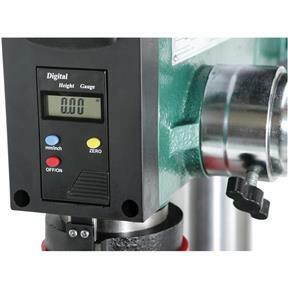 If I new this when I ordered it, I would have went with a higher end model without the laser and depth gauge. 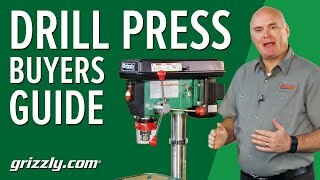 If you need a drill press, look at the better ones. Works great, accurate, and easy to put together. The speeds are very easy to adjust. Excellent addition to my shop. 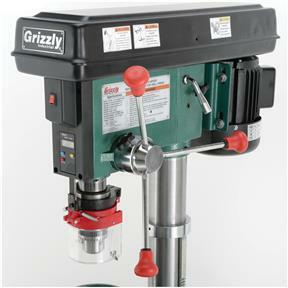 This makes the 10th Grizzly power tool I own. Don't think I would purchase any other brand. Would highly recommend.